The dedication of Rachel Corrie is still an inspiration to hundreds of volunteers in Palestine. Rebuilding what the oppressor destroys without fear, without hesitation. Below is an update of what has been happening, followed by links showing what you can do as well to help make Rachel’s dream a reality. Updates from the Field (or Progress Reports) on GlobalGiving are posted directly to globalgiving.com by Project Leaders as they are completed, generally every 3-4 months. To protect the integrity of these documents, GlobalGiving does not alter them; therefore you may find some language or formatting issues. GlobalGiving.com informed us that our project, the Rachel Corrie Rebuilding Campaign, Gaza 2nd Home is narrowly leading their international competition – and they have extended the competition to July 27th. Please help rebuild the next home in the Rachel Corrie Rebuilding Campaign in Gaza, the home of physiotherapist Ali Al Bahry and his family. Donate now at GlobalGiving and help us win an additional $5000, $3000, or $2000 for this project through an eBay match. 1. Why build this home in Gaza now? Our partner from Gaza, Mr. Husam El Nounou, Public Relations Director for Gaza Community Mental Health Programme, came to the U.S. in June to raise funds for this home. Husam remains stranded in Egypt, unable to return to his home and family in Gaza. Credible reports indicate some 5,000-6,000 Palestinians are stuck in Rafah and Al-Areesh and another 30,000 spread throughout Egypt as the blockade of Gaza enters its second month. Husam’s colleague, Dr. Mona El Farrah, lost her mother, unable to go home to be at her side. Being home, going home, rebuilding home – our work is about all of that. Our projects are symbols of hope that help rebuild shattered communities and offer people around the world immediate ways to make peace, starting with the tangible support of a family’s right to a home. Frankly, we ask your help to rebuild a home for the Al Bahry family, and we also ask you to pick up your phone to ask Congress to speak out against this grueling blockade. Donate now. 2. Rebuilding during the blockade of Gaza? Yes, we can – because we just did! The Rebuilding Alliance completed the first home in the Rachel Corrie Rebuilding Campaign in Gaza on May 24th 2007. We built it for the Nasrallah family, the family Rachel Corrie sought to protect when she stood before the Israeli Army D-9 Caterpillar bulldozer that threatened their home. When friends and family saw the home “that American families helped build,” they volunteered their time and talent to help finish it off right. 3. But how can the Rebuilding Alliance build this house during a blockade, when all imports of building materials have stopped – and even the U.N. has called-off construction projects? Then the family goes to the municipality to confirm title of the land and apply for water and electricity. Please note that this may not be easy: The Palestinian Center for Human Rights, in urgent call to save the judicial system, also reports that the system of permits, taxes, and fees has been suspended. By applying for a permit and doing this publicly with reports back to you, our donors, we’ll find out where things stand. The next step is building – and that starts with clearing land and digging. Our team will be asking the Gaza community to help, a brave step for all who step forward. 4. Can you still transfer funds to the Gaza Community Mental Health Programme for this project? Yes, because the Gaza Community Mental Health Programme is a non-governmental organization, fully in compliance with the U.S. Patriot Act. Funds transfers to Palestinian NGOs for humanitarian projects are allowed. 5. Will rebuilding this house in Gaza somehow help the current government(s)? Ours is a non-governmental project all the way. Construction is supervised by the Rebuilding Alliance’s engineer, the Al Bahry family, and our NGO partner in Gaza, the Gaza Community Mental Health Programme. 6. How does the Global Giving contest work? GlobalGiving.com is offering all projects in their filmfest competition the exclusive opportunity to receive $5,000, $3,000 or $2,000! Thanks to the generosity of one of GlobalGiving’s most valued partners, eBay, three of the pioneering projects will receive these additional funds. Please Donate Now via the GlobalGiving.com website and forward this message to your mailing list. It is a brave move for a family to rebuild during a blockade. Your support means everything. P.S. Urge your senators and congressperson to speak out against this blockade and help Husam El Nounou, Dr. Mona Al Farra and thousands more return home. Please join our planning telecons on Fridays to strategize. The link to the script is listed below. P.P.S. Rebuilding Alliance board member, Jenni Fischer, has created a blog primarily dedicated to her Run for Peace, a 31.3 mile trail run she is undertaking for her 30th birthday as a fundraiser for The Rebuilding Alliance. Its called, “The Good Long Road.” Check it out at http://jennifischer.blogspot.com/. Here’s a script – that can help with your calls to Congress. With the mess that the Palestinian Authority is in at the moment, what is happening to the Private Sector? Two Palestinian businessmen talk about the situation here in the following article….. Contrary to the obligations embedded in the Fourth Geneva Convention of 1949, the signatories of this key Convention — the U.S., UK and Russia (previously the USSR) included — allowed for Israel, the occupying force, to create a structural economic dependency of the Palestinian economy while at the same time applying a maze of restrictions on Palestinian ability to become economically viable. Instead of demanding from Israel the application of international law, these countries, and others, continued reporting, year after year, the Israeli violations of international law while simultaneously footing most of the costs of occupation. “75% of Gaza’s factories have shut down because of the closure of the borders. The rest of the factories are operating on a limited basis, on borrowed time, until the stocks of raw materials are exhausted. – The writers are Sam Bahour (sbahour@palnet.com) and Iyad Joudeh (ijoudeh@solutionsdev.ps), Managing Partners of Applied Information Management and Solutions for Development Consulting, respectively, and based in Ramallah. We are the young men and women of Palestine. We write to you from our Palestinian home that is in transition, wanting to seize the moment to co-create a successful Palestinian state. We are the Future; we wish to participate in shaping our future! We are young, educated, forward thinking, and globally-minded men and women. We hold advanced degrees in Engineering, Information Technology, Sciences, Law and the Humanities. We need a partner in the world community who will give us a chance to show our leadership. We know that you, Mr. Blair, do not subscribe to the perception that all young Palestinians are blinded by ideologies or a limited vision of Palestine. We are very keen on initiating an international dialogue with an overarching vision and overarching goals. We want to lead an accelerated process towards peace, one that guarantees for both Palestinians and Israelis their rights and their future. We extend our invitation to young Israelis to work with us towards the common good, and to build with us the bridge needed for true peace. We are ready to serve as a conduit to wide scale change and make positive systemic contributions to our culture, our educational and legal systems, government and social institutions. We believe in capacity building and empowering Palestinians to move from where they are now to where they need to be. We can serve as a bridge between Western culture and Arab culture. We can co-lead an international dialogue about Peace. Most importantly our unique contribution will be to translate the outcome of the bi-lateral agreements and accords in a way that our culture can embrace. We aim to produce positive responses to any accord that focuses on building a healthy Palestinian state. We want to avoid the failures of the the Oslo Accord, where our leaders did not communicate the desired outcome to us and our people. The decisions made unilaterally by a disengaged leadership came as a shock to an unprepared culture that rejected a premature deal. We are mindful of the breakdown in communication between our leadership and our people, especially with the youth. We can form that link to translate international decisions into local implementations. We ask you to deal with new faces and young people. As you interact with our formal leadership, we need you to encourage the inclusion of our positive voices. We will work very well with people in leadership positions whose expertise and strategic thinking are well respected. We want to be a free Palestine, that is our goal!! · Address holistically the psycho-social problems inside the Palestinian communities caused by decades of conflict. · Build sound economic, educational, judiciary, religious and healthcare systems for a well-functioning society. We are dedicated to a democratic Palestine and to an accelerated process leading to true democracy. We know that as Palestinians we have a unique opportunity to build bridges, cross over divides, create common purpose and take the leadership role, not just in Palestine but in the entire Middle East, and not just here, but around the world. We want to stand tall, accept the challenge, point the way, challenge others and frame a new Palestine. It is Our Future After All …. It is the time to give us a chance. I just received the following from the Tlaxcala Cooperative. I felt I must share it with all of you…. It has now been 20 years since reknown Palestinian cartoonist Naji Salim al-Ali was shot in London on July 22, 1987 by an unknown assassin. He lapsed into a coma and died five weeks later on August 29, 1987. During his life time, al-Ali drew more than 40,000 cartoons and was know for his sharp political wit and criticism of not only Israel, the US but also the Arab states. In his work, he campaigned tirelessly for the rights of the Palestinian refugees, Palestinian self-determination and against the absence of democracy, corruption and inequality in the Arab world. His work was often censored and he frequently received death threats. al-Ali was also detained and jailed in various countries and expelled from others for his political commentary. At 10 years of age, al-Ali and his family were forced to flee Palestine to Lebanon, when Israel invaded and seized the West Bank and Gaza Strip. In Lebanon, he like thousands of others Palestinians, were forced to live in poor and over crowded refugee camps. This experience gave birth to his most famous creation, Handala (sometimes spelt Hanthala or Hanzala). The cartoonist christened his 10 year-old boy creation, who never spoke but was the guardian of the Palestinian cause, after a short bitter bush which can be found throughout all of Palestine. The bush although weak, if cut, has the reputation of growing back, time and time again. 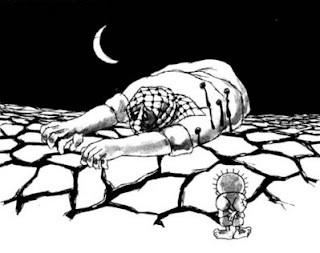 According to al Ali, Handala “protected” his soul when he felt weary and prevented him from ignoring his duty to his people and their struggle: “That child was like a splash of fresh water on my forehead, bringing me to attention and keeping me from error and loss. He was the arrow of the compass, pointing steadily towards Palestine. Not just Palestine in geographical terms, but Palestine in its humanitarian sense – the symbol of a just cause, whether it is located in Egypt, Vietnam or South Africa. I am from Ain Al-Helwa, a camp like any other camp. The people of the camps were the people of the land in Palestine. They were not merchants or landowners. They were farmers. 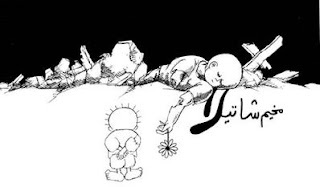 When they lost their land, they lost their lives. The bourgeoisie never had to live in the camps, whose inhabitants were exposed to hunger, to every degradation and to every form of oppression. Entire families died in our camps. Those are the Palestinians who remain in my mind, even when my work takes me away from the camp”. NOTE… I had intended to publish this a few days ago but decided not to… The situation with the person in question is getting worse by the day so I felt obligated to change my mind. She is constantly naming names in her blog, making it seem as the people named are associated with her. THEY ARE NOT. She carries a laptop with her that will go through Israeli security when she leaves, putting in danger the freedoms of every person she met and spoke to…. read the following to see what and who I am talking about. Mordechai Vanunu doesn’t speak to Israeli reporters. He hasn’t forgotten that they were silent during the 12 years he spent in solitary confinement. Vanunu does, however, speak to foreign reporters. They don’t call him “the atomic spy,” preferring terms like “whistle-blower.” But if Vanunu, who was convicted in 1988 of giving details about Israel’s nuclear program to the British press, speaks with foreign reporters – and it doesn’t really matter what he says to them – he gets punished. Two weeks ago, the Jerusalem Magistrate’s Court sentenced him to six months in prison for doing just that. Therefore, Vanunu essentially must remain silent. Vanunu does not want to live in Israel, and not only for ideological reasons. Gideon Spiro, coordinator of the Israeli Committee for a Middle East Free from Atomic, Biological & Chemical Weapons, and one of Vanunu’s only Israeli friends, says it is unlikely that anyone in Israel would rent Vanunu an apartment. He is also liable to be attacked in the street. Vanunu therefore does not dare set foot in West Jerusalem, remaining in East Jerusalem. There, too, he lives in a kind of isolation. The Palestinians sympathize with him, says someone who knows Vanunu well, but are afraid to get close to him because the Mossad, the Shin Bet security service and the Defence Ministry all see him as one of the greatest threats to the State of Israel. “They planted around him, outside, the bars of the prison where he sat for 18 years,” said Michael Sfard, the attorney who, together with Avigdor Feldman, represents Vanunu. The entire article can be read HERE. Vanunu has stated on numerous occasions that he was imprisoned because of his conversion to Christianity. Nothing is further from the truth. Vanunu was imprisoned because he committed a crime in Israel. He gave over classified information about Israel’s nuclear programme to a British journalist, at a time when he was in the employ of the nuclear facility in Dimona. His conversion to another faith does not enter the picture at all, in fact it is not recognized by mainstream Judaism. When a Jewish male enters into the Covenant of Abraham Our Father on his eighth day, that contract cannot be broken. So in reality, Mordechai Vanunu who was born a Jew, will die one. The Israeli prison system was successful in breaking the spirit of this poor man. I have seen him on numerous occasions walking the streets of East Jerusalem looking like a lost soul. He hid himself away in one of the rooms of a Christian monastery until very recently. In the evenings he hangs out in the bar or restaurant of the American Colony Hotel, home to most foreign journalists visiting Israel. It was there that he had many an opportunity to violate the primary condition of his parole by granting interviews to these people. There is nothing new for him to speak of to these reporters, nothing has remained the same at the Dimona facility, he has no idea what is going on within that compound. The parole condition was strictly a way of further harassing this already tortured soul. Before I continue, I must state that it is not my style to publicly attack or criticize anyone that is part of the movement to free Palestine. I never get involved in the petty, personal in-fights between some of our European ‘anti-zionist’ bloggers. In her blog of Saturday morning she makes reference to the article above from HaAretz. Eileen is here on an independent ‘fact finding mission’. She is here uninvited and unwanted, more so by Vanunu himself. On her last visit to Israel she produced a video of an interview with him. Knowing that his trial was coming up shortly, he asked her to remove the video from her site. SHE REFUSED TO. She told him that she is an American and it is important for the American people to be aware of his case, a right guaranteed them under the Amendment for Freedom of Speech. The FACT that this might help cost the man his Freedom completely did not matter to her. What does matter to her is this was a perfect opportunity to promote her own name, her own causes and the books she wrote. Eileen fancies herself as a Brenda Starr wannabe. One thing she fails to realize is that Brenda Starr is a cartoon character. Brenda did not mix where she was not meant to, and never put people’s lives or freedoms at risk. In her blog entry of yesterday she goes into HER history with the man, plugging (again) HER interviews with the man, emphasizing HER concern for the man. She does not impress me one bit with her self promotion, nor with her recent habit of declaring one to be a Saint or a Prophet, a term not usually appreciated by those who might be believers. As if her damaging blog of Saturday was not enough, she had to add insult to injury by commenting on other sites as well… again for the same purpose of self promotion. She starts her comment with…“I write to you from Jerusalem, and the truth is that Hamas has said they recognize the reality of Israel, but Israel has yet to recognize the rights of Palestinians and the Jewish convert to Christianity and whistle blower of Israel’s WMD program, Mordecahi Vanunu. Does anyone else NOT SEE a connection between Israel’s non recognition of Hamas and Palestine with the Vanunu case? Does anyone else NOT SEE the way she operates? She hears or sees the name Vanunu and she’s ‘right there’ plugging her own claim to fame. Flemming much to often reverts to her Brenda Starr fantasy and negates reality completely. The reality being that Flemming is NOT a journalist. Journalists carry with them press cards or verification from an organization that they are representatives of same. Flemming has neither. She claims to be an activist for the Palestinian cause. If this were the case would the residents of a refugee camp near Bethlehem assign a SIXTEEN year old boy to be her tour guide? (read about this in a blog entry of a few days ago) I get the distinct impression that I am not the only one that does not take her serious. Her social outings and visits to ‘friends’ is often interpreted as activism by herself. All I can say to this woman is,paraphrasing her own words, DO SOMETHING…and GO HOME! You are not wanted here and you are not doing anyone any good by being here. Go into your Brenda Starr mode and hang out at Disney World. It’s much closer to your home and much less dangerous to the real people you are hurting here. I’ll be offline today and tomorrow…. Click on my links and enjoy! Seeya Sunday. If an election was held in your country today and two parties were running, how would you vote? One naturally looks at the two, their candidates, their platforms, their proven records…. One considers which one will be the best to represent their interests in whatever government is formed…. If you read the following article from today’s HaAretz, you will see why the people of Palestine chose Hamas over Fatah. They seemed to know that a vote for Abbas was a vote for continued occupation, genocide and apartheid. So he was rejected…. Proof of the pudding can be seen here…. WAR CRIMINAL is the only way to describe Abbas at this point in history…. Palestinian Authority Chairman Mahmoud Abbas asked Israel and Egypt prevent the movement of people from Egypt to the Gaza Strip through the Rafah border crossing, after Hamas’ mid-June takeover of the coastal strip, Palestinian sources said Tuesday. Abbas said that if the crossing is opened, Hamas will be able to let in thousands of people without supervision into Gaza – including activists who could strengthen the group, which rival Abbas’ Fatah movement. The Rafah border crossing has remained closed since Hamas’ ousting of Fatah from Gaza. THIS is what Abbas wants continued. CRIMINAL! FACT…. In January of 2006 the Palestinian people went to the polls and elected Hamas to lead them. FACT…. In January 2006 Israel, The United States, Britain and others declared that they will NEVER recognise a government set up by Hamas. FACT…. Israel has intensified its policis of genocide and apartheid against the Palestinian nation since the day of their election. FACT…. Israel has withheld millions of dollars owed to the Palestian Authority from tax revenues, making it virtually impossible for Hamas to operate efficiently. FACT…. In June of 2007, Israel and its western allies instigated a coup in the Palestinian Authority, helped set up a puppet government in the West Bank led by former President Mahmoud Abbas, further isolating the legitimate government led by Prime Minister Ismael Haniyeh. NOW… Israel and its allies are satisfied that Palestine is once again (still) under their control and is prepared to make peace with them. But who is THEM???? It seems that THEM is everyone BUT the Palestinians. THEM is the USA, Britain, the European Union, Russia and the United Nations (the Quartet)… Seems that EVERYONE but the Palestinians are running the affairs of Palestine. Is this the road to peace? I think not. Peace is not a one sided deal and will never become a reality without the input of the parties involved in the conflict. Hamas officials had the following to say about Bush’s call for a ‘peace conference’…. Hamas rejected US President George W. Bush’s call for an international peace conference in the fall on the Israeli-Palestinian conflict, which “aims to serve the interests of the Zionist enemy” according to Hamas spokesperson Ismail Radwan. “Such a summit will lead to increased pressure on (PA President Mahmoud) Abbas, and will tear a deeper rift between Palestinians in the Gaza Strip and the West Bank,” Radwan declared. The rest can be read in THIS report from Ynet…. Former British Prime Minister Tony Blair is to arrive in Jerusalem on Monday next week to begin work as the “Quartet” special envoy to the region. As the emissary of the group made-up of the United States, European Union, United Nations and Russia, Blair has taken upon himself to establish Palestinian institutions as a basis for the future Palestinian state. Blair’s mission will be officially launched at a meeting with Quartet ministers in Lisbon on Thursday. Blair said he would stay in the region for one week every month. He has appointed as his chief of staff Nick Banner, who worked with Sir Nigel Sheinwald, Blair’s foreign policy adviser in Downing Street. He intends to add staff members from the USAID agency, the United Nations, the European Union and Russia. A suitable building for Blair’s office in Jerusalem has not yet been found due to high real estate prices. The United States helped to create the chaos in Gaza and the West Bank and now has the ‘chutzpah’ to advise its citizens not to visit there. I question the motives behind this travel warning…. is it for the safety of its citizens, as they claim, or is it to prevent Americans from seeing the real truth of what 40 years of American supported Israeli Occupation looks like. Americans are not used to seeing walls built to separate families from each other. Americans are not used to seeing children shot dead for flying kites or playing on the beach. Americans never saw a pregnant woman being prevented from getting to a hospital to give birth. These are just a few examples of what Americans never saw. The United States issued a fresh travel warning for Israel and the Palestinian territories on Friday to include American journalists and aid workers after a spate of violence and political instability. In a notice that superseded a warning issued on Jan. 17, the State Department urged U.S. citizens to be mindful of security when considering travel to Israel, to defer trips to the West Bank and avoid all travel to the Gaza Strip. “American citizens in the Gaza Strip should depart immediately, a recommendation that the State Department has maintained and renewed since the deadly roadside bombing of a U.S. Embassy convoy in Gaza on Oct. 15, 2003,” it said. The statement noted “considerable violence” in the Gaza Strip in recent months between Palestinian factions and between Israeli security forces and Palestinian militants. Palestinian Authority Chairman Mahmoud Abbas rejigged his government on Friday upon the expiration of a state of emergency he had declared when the Islamist movement Hamas violently seized control of Gaza a month ago. Hamas, which has militant and political wings, won an election victory 18 months ago that led to an international aid embargo of the Palestinian Authority. The United States, a key ally to Israel, lists Hamas as a terrorist organization. The travel warning said militant groups in Gaza continue to launch rockets against nearby Israeli towns and urged U.S. citizens to “exercise a high degree of caution” when going to restaurants, malls, places of worship and other public places. 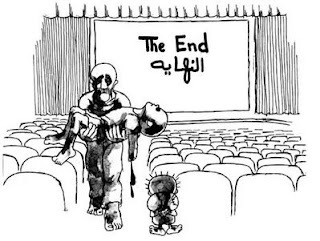 With all that is going on in the Middle East today, Palestine, Israel, Iran Iraq…. we mustn’t forget that the people of Darfur are still suffering as well. John Lennon’s song Working Class Hero is being used in the campaign to end the fighting there…. ‘Politics breeds strange bedfellows’… there is no other way to describe this new glowing love affair between Abbas’ puppet regime and AIPAC. Is this not proof that this new ‘leadership’ of the Palestinian people is working only in the interests of Israel, abandoning completely the desires of their own nation? Since its formation in 1953, the most intensive period of the Cold War, AIPAC has been dedicated to the eradication of the Palestinian people. They have openly supported every genocidal crime committed by Israel since that time. And now this? Support of Abbas and Company? One has to wonder if that is the case, what are Abbas’ true motives? Is the total destruction of Palestine on his agenda? He already carved the nation in half… what’s next? If the enemy of my enemy is my friend, that what could you call the friend of my enemy? Both AIPAC and Abbas have proven to be enemies… they look good in bed together! Washington – Pro-Israel lobbyists and legislators have become unexpected cheerleaders for the Palestinian leadership after the new Fatah-led Cabinet took action against Hamas. Yet Abbas will meet with them next week in Jericho… also UNFORGIVABLE! A 25-year-old Fatah member who was injured during the recent clashes with Hamas in Gaza was denied entry to Israel for medical treatment and lost both of his legs as a result. According to the Sin Bet and the IDF District Coordination Office’s (DCO) position on the matter, which was submitted to the High Court of Justice, the Palestinian was deemed a security threat. Ma’ala Uda was prohibited from entering the country despite the opinion of Prof Professor Raphael Walden, Deputy Director of the General Hospital at the Sheba Medical Center at Tel Hashomer. At the time Walden wrote that Uda required immediate medical attention “or else his legs may have to be amputated”. The DCO rejected the request and one of the Palestinian’s legs was in fact severed. During a hearing on the matter it was made know that his other leg was also in danger, but the High Court adopted the Shin Bet’s standpoint that Uda was a security threat to Israel. Two days later the Palestinian’s other leg was amputated in Gaza. “With all due respect to the Shin Bet’s work and concern for Israel’s security, I fail to understand how a man who is missing one or two legs can jeopardize the country’s security; it’s simply ridiculous,” Ran Yaron of the Physicians for Human Rights organization said. Another Palestinian, who was at risk of losing his eyesight, was also denied entry to Israel on similar grounds. The Physicians for Human Rights group claimed Wednesday that in recent weeks the High Court has been discriminating between Palestinians whose lives were in danger and those who had sustained less severe injuries. The group said there were numerous cases in which Palestinians were denied entry to Israel due to security concerns. In one such case, a 19-year-old Palestinian suffering from a brain tumor died after the approval of his request for an entry permit was delayed. The Shin Bet said in response that the Palestinian petitioners were linked to terror groups. I noticed over the past few days that I have been getting hundreds of new readers from… Russia, of all places. They are clicking onto my site via THIS link. I have no idea what that site is saying… or what they said about my blog, but it seems to be generating allot of interest. All I can say to these people is… WELCOME TO MY BLOG! Hope you enjoy it and come again!! Yesterday the UN issued a report on the status of the ‘separation fence’ and its effect on the Palestinians trapped on the wrong side of it. A whole nation is being collectively punished because of the whims of zion, whims that are slowly killing that nation, one by one, starting with the unborn. Border Control / Who told them to give birth at night? The small village of Azun Athma is located in the southeastern part of the West Bank, not far from Qalqilyah and too close to Israel and the Jewish settlements of Etz Efraim, Elkanah, Sha’are Tikva and Oranit, which surround it in all directions. To ensure the security of the residents of Israel and for the sake of the settlers’ convenience, the Palestinian village has been encircled by a fence and has become an enclave closed on all sides. In order to partake of essential services in the West Bank, the inhabitants of Azun Athma pass through a gate controlled by the Israel Defense Forces. They undergo physical searches each time they exit and enter. At 10 P.M. the soldiers close the gate and only open it again the next morning at 6 A.M. It is common knowledge that the Palestinians suffer from a serious lack of discipline, which starts in their mother’s womb. 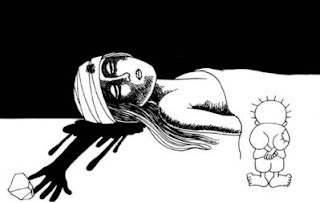 There are fetuses that insist on coming into this world right at the time when the Israeli soldiers go to sleep. What is to be done with these babies when Azun Athma only has a clinic providing the most basic services for two hours, twice a week? To make sure they will receive proper medical care during the birth, pregnant women (in an average year about 50 babies are born in the village) tend to leave their homes and move in with relatives, who reside in places where one can obtain accessible and good medical services. Thus, of the 33 babies that were born to inhabitants of the village between January of this year and the beginning of June, 20 were born outside the village. The others were born in their mothers’ homes without the aid of a doctor or a qualified midwife. According to a report published yesterday by the United Nations Humanitarian Coordinator and the UN Relief and Works Agency for Palestine Refugees in the Near East (UNRWA), the publication of which coincided with the third anniversary of the ruling by the International Court of Justice in The Hague concerning the security fence, the 10 Palestinian communities surrounded by the fence have no access to 24-hour emergency services. The authors of the report estimate that when construction of the fence is completed along the planned route, about 50,000 people will find themselves in a similar situation. Their examination of 57 Palestinian communities also shows that the ruling of the International Court of Justice has not resulted in a dramatic change in the situation: of the 61 passages in the fence, only 26 are open all year round for the use of Palestinian farmers, while less than half the farmers enjoy direct and regular access to their lands; the gates are open only 64 percent of the planned and declared time; in 72 percent of the communities there have been complaints about routine humiliation and verbal harassment on the part of the soldiers; 24 percent of the communities complained of damage caused to produce as a result of being refused entry to agricultural areas; and 85 percent of traditional roads have been ruined and cut off by the fence. Colonel (res.) Shaul Arieli, who represents the Council for Peace and Security in petitions against the fence route, has repeatedly presented the High Court of Justice with alternative routes that would save the state coffers hundreds of millions of shekels. He notes that it was the High Court of Justice that rejected the opinion of the International Court of Justice in The Hague on the grounds that its decision had been made on the basis of incomplete and mistaken data. According to Arieli, the fact that the government and the security establishment are ignoring a number of High Court rulings constitutes contempt of the court and the rule of law in the eyes of the world. In addition, this attitude is delaying completion of the fence and has already sent more than a billion shekels down the drain. The head of the Palestinian negotiating team, Saeb Erekat, has also not forgotten the anniversary of The Hague ruling. In a letter he sent to American Secretary of State Condoleezza Rice and the other heads of the Middle East Quartet, Erekat has demanded that they ensure that Israel stop construction of the fence and fulfill its commitment, undertaken in the road map, to freeze all construction in the Jewish settlements in the West Bank. If the Palestinian Authority, at least the one in Ramallah, is once again a partner for agreements, then someone might well take those demands seriously. Or not. If it did not deal with human beings, including infants, the latest report published over the weekend by the UN Office for the Coordination of Humanitarian Affairs (OCHA), in the occupied territories, on the humanitarian situation in the Gaza Strip would be one of the funniest documents ever published here. Basing himself on UN World Food program (WFP) figures, the coordinator notes that this is “a significant increase from the prior week, where only 21 percent of the food needs were met.” The authors of the report do not confine themselves to general data. They append a table that details daily local consumption in the Gaza Strip alongside the level of imports and the local supply. Not only in metric tons; someone went to the trouble of calculating the percentages for them. And there is also a total of the two. The report’s implication is that if there is no flour, let them eat animal feed. If there is no rice, drink oil. If there is no hummus, lick sugar. What is important is that the total amount of essential foodstuffs reaches 70 percent. Behind these dry numbers lurks a juicy story about the tense relations among the UN organizations operating in the territories. It turns out that at OCHA’s Jerusalem offices they are quite ashamed of this document, which bears their organization’s name. The instruction to publish it came from the office of Kevin Kennedy, the humanitarian coordinator in the office of Michael Williams, the UN secretary-general’s special envoy to the territories. In this branch of the UN they are trying to curry favor with the Israelis and the Egyptians, who, as everyone knows, are not going out of their way to enable Hamas to maintain orderly life in Gaza. The envoy’s office stands firmly behind the Israeli position, which insists on operating the Kerem Shalom crossing point in particular, despite strong objections by the Palestinian side. The office also supports Egypt’s objections to opening the Rafah crossing point without European inspectors. Members of the Meretz Knesset faction, who returned yesterday from a visit to Cairo, were told in the Egyptian capital that “it is necessary to prevent a humanitarian crisis in Gaza,” but “it mustn’t become too good there.” Faction head MK Zahava Gal-On said that to the best of her knowledge an economic boycott has not resulted in strengthening the moderates. Kennedy’s office has responded that there is no significance to the calculation of the average supply of various foodstuffs and hence to the ostensible improvement in the humanitarian situation. It was promised that this would be fixed and would not be repeated in future reports. The State Attorneys’ Office has good news for the inhabitants of the territories. Good? Terrific. In an official document signed by attorney Orit Koren, the director of the department of petitions to the High Court of Justice, the State of Israel announces that its presence in the West Bank, also known by the name “Judea and Samaria,” is only temporary. This according to a written statement sent by the Prosecutor’s Office to the High Court of Justice, in the wake of a petition launched by Attorney Michael Sfard, who represents the inhabitants of the village of Bil’in and Peace Now. The petition concerns construction of the new neighborhood of the Modi’in Illit settlement, known as East Matityahu, without an approved master plan. “With this in mind,” explains Koren, “the regional authorities have consciously refrained from comprehensive and long-term planning of the region’s territory in its entirety.” It is not clear why the regional authorities have discriminated against Modi’in Illit’s little sisters, among them Ma’aleh Adumim, Ariel and Betar Illit, and have required them to submit master plans. It is not clear how the excuse of the “temporary nature” of the occupation fits in with the state’s position in petitions concerning the route of the fence, including in the area of the settlement of Tsofin, which claim that the planners took into account the master plan that expects expansion of the settlement. The following was written by Robin, she has been personally involved in the support movement for First. Lt. Ehren Watada since his case started. After this public announcement, he went on to speak publicly in other events, most notably, his appearance at a Veteran’s for Peace Rally in August. He also gave an interview to Sara Olson. Ehren was charged with missing in movement and conduct unbecoming of an officer based on his public appearances as well as interviews given. Two of those charges, those stemming from the written interviews, were dropped at the time of the first court marshal because Ehren stipulated to having made those statements in order to prevent Sara Olson and Dahr Jamail (who had simply transcribed and published one of Ehren’s speeches) from having to go against journalistic priveledge when the government subpoenaed them to testify against Ehren. Ehren also stipulated to missing in movement, simply because for anyone following this case at all, one should know that Ehren missed movement purposefully based on his firm belief that the war is not only immoral, but also illegal. Ehren NEVER denied or plead innocent to missing in movement. For those of us sitting in the courtroom that day waiting for the proceedings to begin, time wore on. What was to begin at 8:00 soon became much later. When the judge finally appeared, at that time, it became clear what had gone on behind closed doors. Judge Head began his questioning of Ehren by asking him if he understood that he had admitted to missing in movement. Ehren replied that yes he understood and there was a reason WHY he missed movement. At that point the judge asked Ehren to withdraw his stipulation which Ehren and his attorney Eric Seitz refused. Seitz INSISTED his client had a defense as to why he missed movement and they were prepared to put that defense on. Then the judge over the next hour or more, stated his own inclination to declare a mistrial due to a “misunderstanding between the prosecution and the defense” and that the trial would have to stop because “all parties were not on the same page as to the understanding of the issues”. He then ordered all parties back to closed chambers. When all parties came out, it was the prosecution who asked for the mistrial at which time Judge Head quickly granted the motion. The overflow room where the press and 42 “guests of the court” was in absolute dumbstruck awe of what had just occurred. Through Judge Head’s manipulations, not only was Ehren not allowed to testify, but he also stated that Ehren would be retried at a later date. That date was finally set for June 23, but the preliminary hearing including the motion to dismiss on double jeopardy grounds was dismissed yesterday by the SAME judge who manipulated the first court marshal. Furthermore, Judge Head, refused to recuse himself from further proceedings in the case. The charges which were dismissed in the first court marshal have also been reintroduced. Just what is Judge Head seeking to silence? Ehren’s testimony that the war in Iraq is illegal per our own Constitution which is bound by treaty to the Nuremburg Principles which deny the right to wage pre-emptive warfare, a war of aggression and a war against the peace. The military oath which is taken binds one’s duty to the CONSTITUTION not to illegal military orders. You can find Marjorie Cohn’s speech which she gave last year in Ehren’s defense after he came out with the above videotaped public statement by Ehren speaking to these issues. (current President of the National Lawyer’s Guild) here. The weight of many years in prison is sitting on First Lieutenant Ehren Watada’s shoulders for daring to speak out against this war. He is speaking for ALL of us who know this war is not only immoral, but illegal as well. Ehren Watada is a TRUE American hero, the kind of man who comes rarely and who should be supported by all. Please, if you have not yet signed the petition in support of Ehren, please go here. FORT LEWIS, Wash. (AP) – Trying 1st Lt. Ehren Watada again for his refusal to deploy to Iraq won’t violate his constitutional right not to be prosecuted twice for the same crime, an Army judge ruled Friday. Watada’s new lawyers, Kenneth Kagan and James Lobsenz, immediately filed notice they will appeal that double jeopardy ruling to the Army Court of Criminal Appeals in Arlington, Va.
Watada is charged with missing his unit’s deployment in June 2006 and with conduct unbecoming an officer for comments he made about President Bush and the Iraq war. If convicted, he could be sentenced to six years in prison and be dishonorably discharged. The lieutenant contends the war is illegal and he would be party to war crimes if he participated. His first trial ended in a mistrial. The military judge, Lt. Col. John Head, presided over the first trial in February and ended it after questioning whether Watada understood a pretrial agreement he had signed. Head also refused Friday to disqualify himself from the case. Head also ruled against Watada’s defense team when they contended his decision to declare a mistrial in the first court-martial was wrong. The developments are likely to delay the start of the second trial, which had been scheduled to begin July 23. Watada, who is based at Fort Lewis, continues to perform administrative duties. Kagan argued Friday that Head should step away from the case because the judge has created the impression that his mind is made up on some issues. The lawyer noted an e-mail that Head’s supervisor sent the judge in February, indicating she believed the mistrial did not create double-jeopardy issues and that a second court-martial could proceed. Kagan said the e-mail suggested there was pressure on Head to rule a certain way. Head denied he has any preconceived notions. Lobsenz told the judge he erred in the first trial by not exploring alternatives to calling off the trial midway through. Head ruled against Watada on that issue without comment. He is expected to issue a written decision early next week. The judge is also expected to rule on admissibility of evidence, including whether Watada may call witnesses to testify about the legality of the war. Head excluded such witnesses in the first court-martial. Read THIS as well,also from Robin’s blog. JERUSALEM – Media advocacy groups condemned the shooting of a cameraman for Hamas TV who lay wounded on the ground when he came under more fire during a clash with Israeli troops. The incident, captured by TV cameras, took place Thursday during heavy fighting between Hamas militants and Israeli forces in central Gaza. The cameraman, Imad Ghanem, had to have both legs amputated as a result of his injuries. Israeli army spokeswoman Maj. Avital Leibowitch, has said it was not clear who shot Ghanem, a cameraman for the Hamas-allied Al Aqsa TV, though she did not deny it could have been Israeli troops. There are no plans to investigate, she said. Leibowitch said the cameraman was a legitimate target because he was with the Hamas gunmen firing at Israeli forces, was separated from other journalists covering the clash, and could have been carrying a weapon. The shooting was captured on film and broadcast on al-Jazeera satellite television, but the footage did not show who fired at Ghanem. However, Ghanem later said from his hospital bed the shots came from an Israeli tank. On Friday, the Brussels-based International Federation of Journalists condemned the shooting and called for an investigation. Two other media advocacy groups, the Committee to Protect Journalists and Reporters Without Borders, also have issued protests. “The Israeli military’s repeated attacks on media and journalists during military operations are unacceptable and constitute violations of international humanitarian law,” said Reporters Without Borders. The group demanded an investigation into why soldiers continued firing toward Ghanem after he had been injured. The New York-based Committee to Protect Journalists also called for an investigation. THIS was too funny not to share…. you must watch it. Our Journey will take us through places such as Ft.
had such a deeply detrimental affect on people. sit-in in his office is possible and likely. Middle East caused by the Bush High Crime Cabal. with leading activists and musical entertainment. you go to turn on your tap for plentiful, clean water? alleviate suffering and change the world.